NIDEC duty belts have evolved over the years and today the CCN35 is on duty by thousands of police officers and security personnel. Its high quality and perfect finish makes it the first choice of many clients. Unlike other belts offered in the market, The CCN35 is the only truly built with super fabric called "Ballistic Nylon ®. This nylon fabric is more resistant to tear, cut, abrasion and moisture than any other. Its molecular structure makes it virtually unbreakable. This gives the belt an extremely rigid vertical structure, while horizontally it keeps being flexible, so the user can load the CCN35 belt with as many accessories without the fear to overcomes or bend it because of the weight. The ballistic nylon provides excellent resistance to abrasion, total insensitivity to ultraviolet rays and is a waterproof material that will never provide "curls" or fabric deterioration like those belts of lower quality. All CCN35 have a flexible polycarbonate inner soul, covered on both sides with ballistic nylon and hold together by a highly resistant stitching of the well known fishing line called Teklon ®. This codura-based ceramics thread, can withstand very high forces and resistances, which ensures a lifetime of 10 years of the Ballistic nylon belt NIDEC CCN35. The efficient composition of the CCN35 spreads the load of the belt accessories and mitigates the pain effect of pressure point of the heavier elements of the belt. On the other hand, The CCN35 professional duty belt, comes with a 3-point fastening and locking buckle made of high-density polycarbonate to ensure the belt is always closed and lock to prevent accidental opening when strong pulling or when in violent interventions the bad guys try to disarm de Agent. Our HEB25 buckles can be easily opened by the Agent, once the trick is known. The CCN35 inside part has a soft Velcro® so if you also use any of our NDC sheaths, holsters and pouches, they will get completely stuck. Moreover if you use our CCN35 duty belt with our CCN38 male velcroed inner belt, you will get the perfect combination ever. 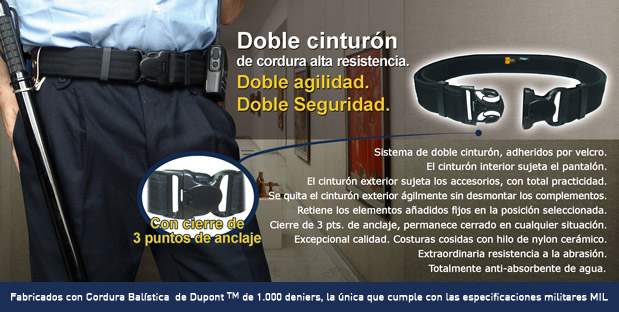 The use of double belt, CCN35+CCN38 guarantees you the belt and all accessories on it will remain in the same place. HOW TO USE THE DOUBLE BELT SYSTEM? The NIDEC inner belt with reference CCN38 is used to fasten your pants. Pass it through your pants fastening strips and overlap both tips so it gets tightly coupled. As CCN38 has male side Velcro®, it perfectly adheres to the outer duty belt CCN35, which has the female sided Velcro®. Thus, with full effectiveness, your duty CCN35 belt will not move. Not only because you tight and buckl it up, but the Velcro ® disposed along the belt. The various accessories Agents normally mount on a duty belt have to be slip through by passing them one by one to the desired position and then fixing the position with belt tabs or separators like the TRC22 . But today, this time wasting maneuver is no longer necessary. All NDC accessories include the DVSS system ® (Double velcroed Strap System), which allows you to directly place and adhere any accessory to the belt with a double flap Velcro ®. All daily needed NIDEC gear and accessories for the police officers, soldiers and private security personnel, have this revolutionary DVSS system that allows you to quickly add or remove any accessory on or out your CCN35 belt. Another advantage to use the double belt is the user can quickly take off the duty belt, storage it in the locker, without the risk of any accessory moving or sliding, and without the need to unbutton loops, tabs or separators. In addition, the inner belt CCN38, is always placed in your duty pants, so wearing the CCN35 duty belt is as simple as paste it around your waist and buckle it up. NIDEC belts are manufactured with ballistic nylon, the only fabric that meets military specifications MIL. • Structure: C3 polycarbonate with double ballistic nylon sandwich. • Interior: lined with female sided Velcro ®. • Seams: Longitudinal by reinforced Teklon ® thread. 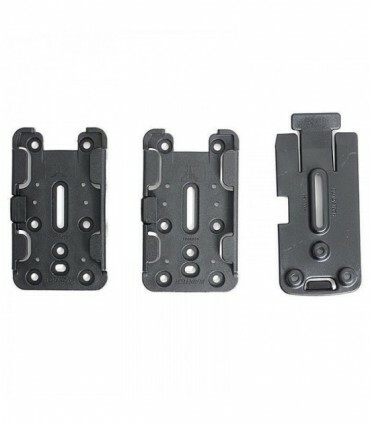 • Buckle: Triple locking points HEB25 . • Compatible with CCN38 inner belt and any sheath, pouch and holster. Best with NDC accessories because of the DVSS system. GHOST CARBON FIBER IPSC BELT. The CCN38 is the interior belt to be used aong with the duty belt CCN35. It is manufactured with Ballistic Nylon®.